Former Guns N’ Roses guitarist DJ Ashba was arrested for suspicion of DUI in his former hometown of Fairbury, IL on July 27. TMZ reports the rocker was initially pulled over by police for driving through a stop sign; when he showed signs of impairment, officers gave him field sobriety tests and he was taken into custody. Born in Indiana and raised in Fairbury, the current Las Vegas resident was in town to perform the National Anthem at the Prairie Dirt Classic at the local speedway on July 28 as part of a pay-per-view event. As part of their coverage, TMZ shared images of Ashba’s mug shots from the Fairbury Police Department. 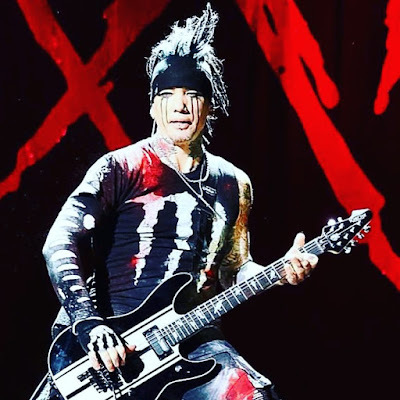 The guitarist was a touring member of Guns N’ Roses from 2009 to 2015, leaving the lineup ahead of the early 2016 reunion of Axl Rose, Slash and Duff McKagan to focus on his work with former Motley Crue bassist Nikki Sixx and singer James Michael in Sixx: A.M. The group issued two albums in 2016 – “Prayers For The Damned, Vol. 1” and “Prayers For The Blessed, Vol. 2” – before going on hiatus; Ashba and Michael launched a new project, Pyromantic, earlier this year. Labels: Guns N Roses, Sixx:A.M.